It’s Tuesday ALREADY?!?! Where Does The Time Go??? Wow. Time flies, doesn’t it? Especially as you get older, it feels as if the hours and days, weeks and years simply fly by. This reminds me, as I look out the window and see the beauty, that time is so very fleeting. We should all make more of what time we have before it is all gone…. A couple of days ago the tree out front was absolutely covered with gorgeous, golden leaves. Now, she is dropping her finery, and I miss the fleeting beauty…. 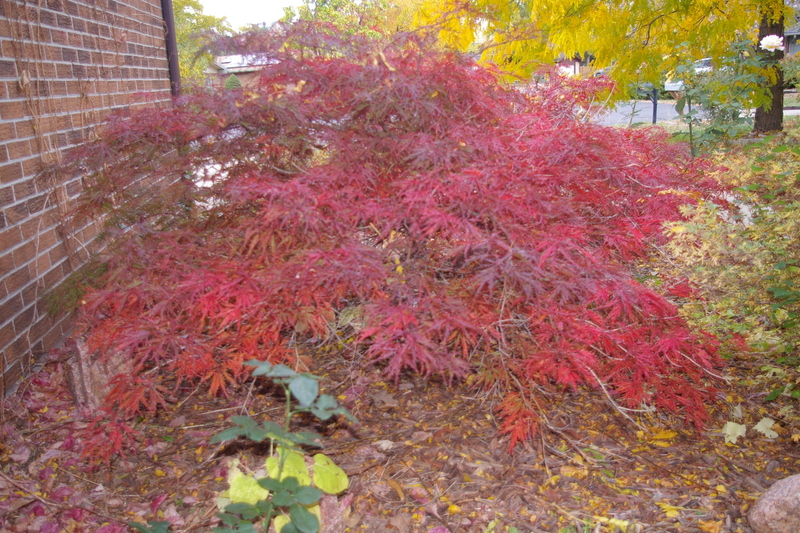 The Japanese Maple is actually a more glorious than it appears here. Photos I take never quite display what I see with my eyes…ah well, it is still pretty! And finally, the last of the summer roses. One delicate blossom, now gone . . . I still have a whole bouquet of roses in the garden… wonderful for this time of year. Lucky you! Just over 20 degrees last night…gone, gone, all gone gone…. I adore mine. It is in a sheltered corner, away from the worst of the winds we get here in Golden, so it has thrived, thank goodness! Fall is a wistful time, but November is sad. Maybe that’s why they stuck Thanksgiving in it. With all the trees bare, between seasons, it can be a very sad month.